Sun-Ah Jun (ed.) (2005). 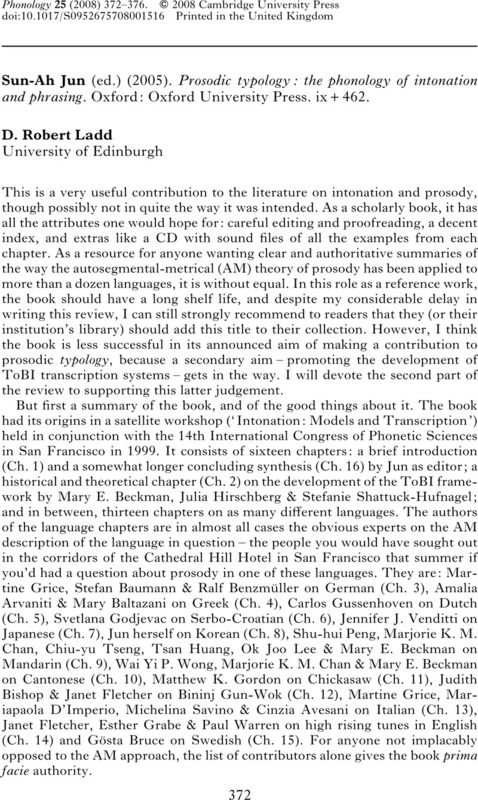 Prosodic typology: the phonology of intonation and phrasing. Oxford: Oxford University Press. ix+462. Beckman, Mary E. & Pierrehumbert, Janet B. (1986). Intonational structure in Japanese and English. Phonology Yearbook 3. 255–309. Grabe, Esther (1998). Comparative intonational phonology: English and German. PhD dissertation, University of Nijmegen. Haspelmath, Martin (2007). Pre-established categories don't exist: consequences for language description and typology. Linguistic Typology 11. 119–132. Huddleston, Rodney & Pullum, Geoffrey K. (2002). The Cambridge grammar of the English language. Cambridge: Cambridge University Press. Ladd, D. Robert (1978). Stylized intonation. Lg 54. 517–540. Ladd, D. Robert (1996). Intonational phonology. Cambridge: Cambridge University Press. Ladd, D. Robert (2008). Intonational phonology. 2nd edn.Cambridge: Cambridge University Press. Newmeyer, Frederick J. (2007). Linguistic typology requires crosslinguistic formal categories. Linguistic Typology 11. 133–157. Pierrehumbert, Janet B. (1980). The phonology and phonetics of English intonation. PhD dissertation, MIT.